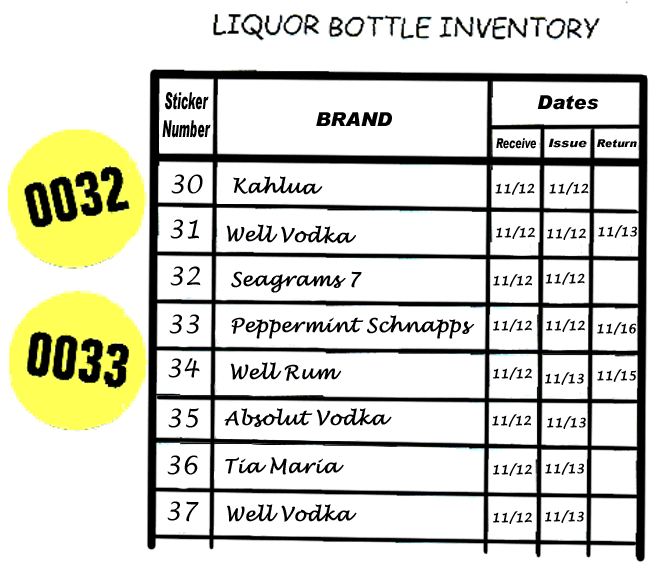 Consecutively numbered stickers applied by managers to liquor and/or wine bottles when product is first received. Inventory numbers and brand assignments are recorded in an Inventory Log Book. Dates are logged when bottles are received, issued to the bar and returned for exchange. Inventory Stickers provide an effective and inexpensive method of tracking the movement of product to prevent bottles from "walking out the back door" or being sold covertly to friends of the employees. 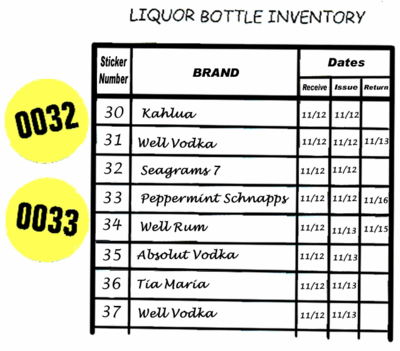 Inventory Stickers are packaged in rolls of 1,000 stickers (control for over 83 cases of liquor or wine). You can print a free PDF version of the Inventory Log Book HERE or for an additional $2 one will be added to your order.